Shortly after I started this site I wrote about Space Ace mini figures from the early 1980s, which--despite having been sold as merchandise tied to the popular video game of the same name--is a line made up of bizarre Masters of the Universe-esque creatures that appear to actually have nothing to do with the game. As you might have gathered by now, I dig obscure stuff. The stranger and more obscure, the better. So naturally these guys are right up my alley. Since my original post I acquired a handful more of them, so decided it was time to devote more blog space to these weirdos. My personal favorite is the dude with the trident in the upper left of the photo above who looks like some sort of mollusk/sea creature warrior. But that's not to say I'm not a fan of the ornery-looking horned guy with the big helmet attached to his arm, too, who I believed is a character yanked from Blackstar. Or mister green Mickey Mouse-meets-He-Man. And of course there are the crappy charms of a couple of them in the bottom row whose faces look sort of blobby, with features that look like they didn't make it all the way there. Ah hell, I like 'em all. 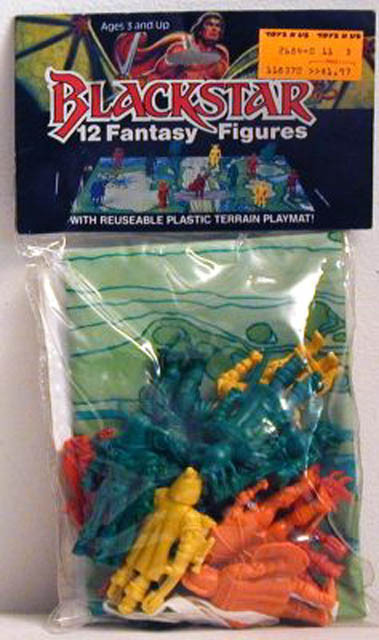 As you can see in this photo from DragonsLairFans.com, these figures came packaged on a card marked "Space Ace Robot Playset" with 8 to a set in addition to a few little spaceships. Uh, these guys don't look like robots to me, but I guess kids weren't supposed to notice/care about that fact. 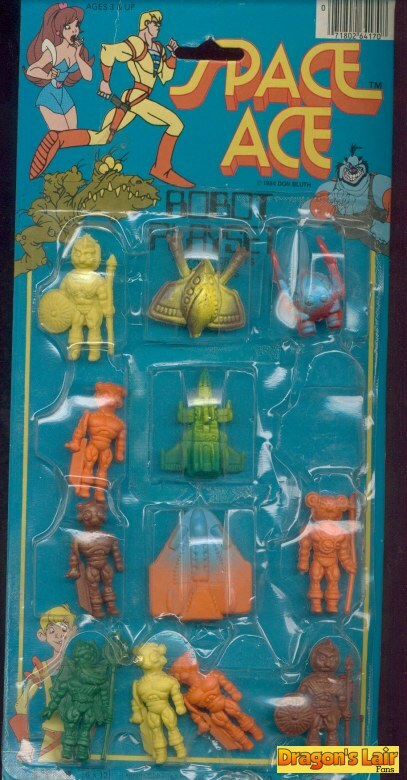 Also, while the package artwork actually features characters from the Space Ace video game, as I mentioned above none of those characters are actually reflected in the figures. Space Ace was a video game made by Don Bluth studios, which also made Dragon's Lair. It is completely unrelated to Blackstar, which was a cartoon made by Filmation. Both toys share a release date of 1984, although the Space Ace figure is unmarked. The characters and molds used for both sets of figures is completely different, although I can understand why they are confused. 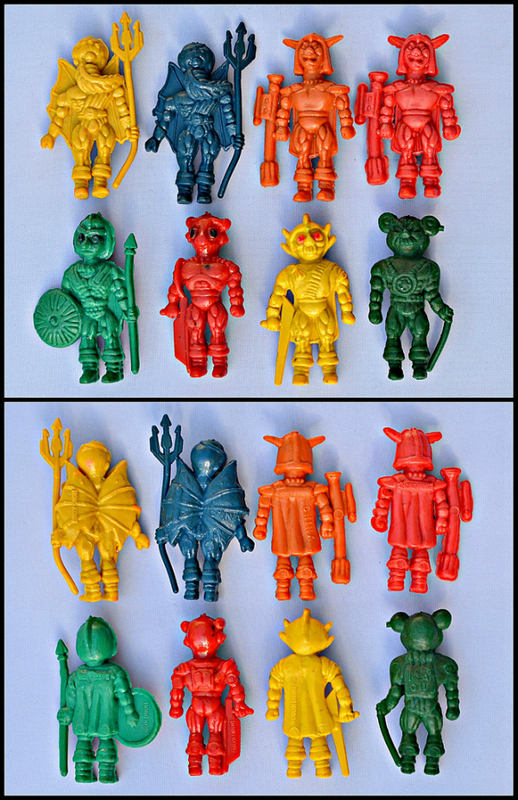 The Blackstar mini-figure set features 6 villains from the series; Overlord, Kadray, Palace Guard, Neptul, Tongo, and Gargo. I don't know if the Space Ace figures have names, but I don't think they do. Is there any relation between the Space Ace mini figures and Blackstar mini figures? Were they sculpted by the same person? Produced by the same company? Why were these characters used for Space Ace video game merchandise? Does anyone know? Does anyone care? These, my friends, are questions for the ages. In any case, there you have it. Space Ace mini figures--some of the weirdest of all the little weirdos. Fabulous post. I love strange little knockoffs too, especially with a space connection. I have a blog as well, Moonbase Central. I'm inspired to do something on Space Ace as well, but I will send readers to your site too.